Weatherproofing Advisors Ltd, one of the UK’s leading industrial and commercial roofing contractors, has made Filon Fixsafe a key part of its stringent Health & Safety programme. Weatherproofing Advisors attaches the greatest importance to health and safety, considering this to be a responsibility ranking above all other management functions within the organisation. The company has even created a memorable marketing campaign around safety super-hero ‘R.U. McSafe’ – to highlight its zero-tolerance approach to safety on-site. So when Director James Turner was made aware of the Fixsafe System for safe replacement of roofing sheets, a trial was immediately set up. 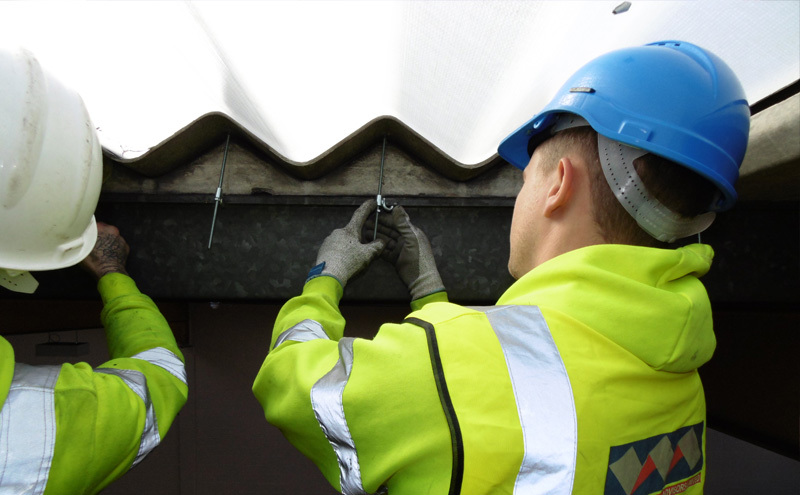 With site safety pioneers like Weatherproofing Advisors making Fixsafe their system of choice, the team at Filon Products believe that the convenience and simplicity of the system will make it an industry standard for profiled roof repairs. In the longer term, the expectation is that even those contractors who may otherwise have cut corners on safety, will choose to use Fixsafe where possible, for reasons of practicality and cost – as well as safety.